UAE has access to the Red Sea? Over 18 million barrels of oil per day through that waterway. There is not the ability to move 10% of that around to the Red Sea today. It would take at least 5 years to build the infrastructure to move half of it. largest land mass, exceeding 2.2 million square km. to Asir to Najran to Qassim to Tabuk. Dammam, which allows it to store and transport oil. oil through the Canal into the Mediterranean. respond to their customers around the world while Iran does not!! I have know idea where you get your information. I got the beginning of mine working in the Arabian Peninsula on the south side of the Rub' al Khali (empty quarter) in the oil fields of Yemen. I worked with several who just came from Saudi. I did some other work with Aramco in 1994 and again in 2001. There is no pipeline that crosses the empty quarter. 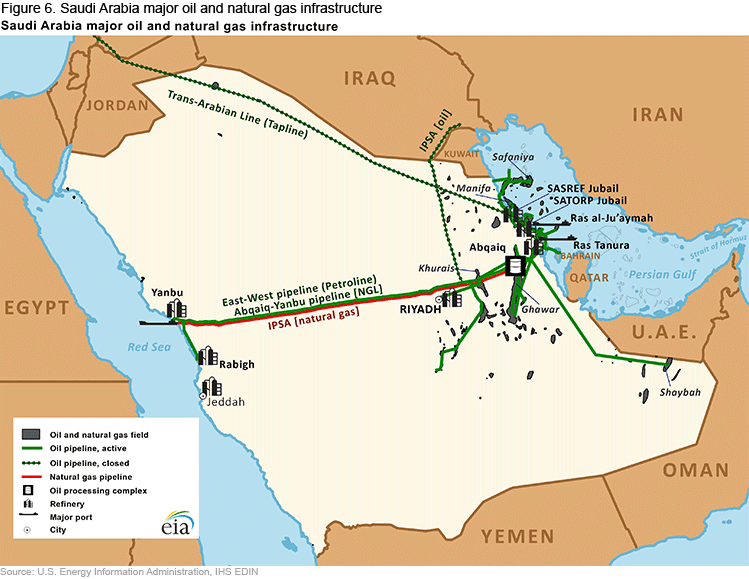 There was one crude pipeline that crosses east-west for red sea access, the Petroline. It was out of commission for decades. In 2012 they worked to get it ready to use again. They also converted the Natural Gas Pipeline into oil service, giving them both a 48 inch and a 56 inch lines. But they have been moving oil through those lines, about 2 million barrels a day already. So there is not full capacity to move additional oil through them that currently goes out the Persian Gulf. They can move some more, 10%, maybe even as much as 15% of the Persian Gulf oil, but there sure isn't 18 million barrels a day pipeline capacity sitting around idle but ready to use. 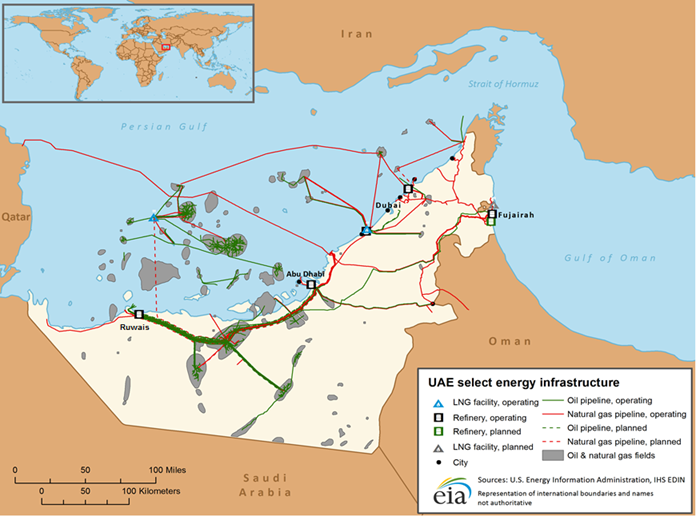 UAE pipeline systems do not connect to Aramco. Why would they ever spend the money for that? They don't sell or move oil to each other. You can make sense of it, but you are likely being deliberately obtuse. South Korea was invaded and subsequent actions were taken by the UN, including armed response and an armistice three years later. No such actions were taken by the US government for any other entity, after the events of November 1979. You can’t retroactively refer to it and declare it an act of war, for the sake of convenience to justify an action almost 40 years later. It is really that simple. your head is in the sand if you do not believe Iran has been and remains at war with us. You appear to seek the UN's approval for the US to be at war. I vehemently am against that as we are sovereign to counter aggression ourselves, solely on our terms. That would have been Truman. The US General that signed the armistice in 1953 did so on behalf of the UN. Uninterested in a urinary contest as my core point was direct and simple. while Iran does not and cannot. Period!!! my core point was direct and simple wrong. 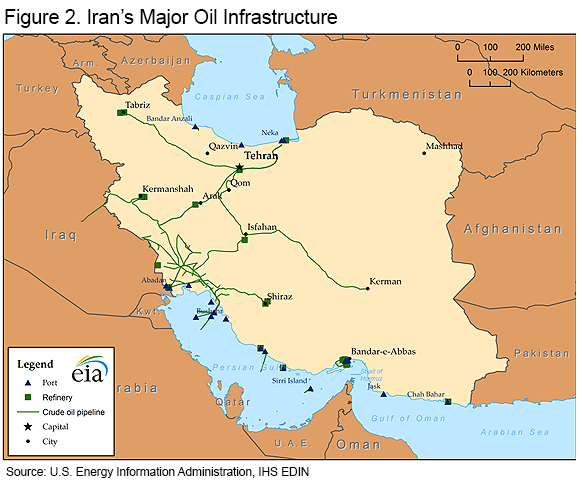 while Iran does not and cannot has a port on the Caspian Sea and natural gas pipelines into Turkey. Period!!! Fixed your typos. You seem to forgotten all the other countries. That 18 million barrel per day is not coming from only Saudi. Most of it is from other countries. I saw a data stream that would seemingly prove @Absalom is correct. While I cannot verify that information, the logic, or logistics, appear valid. "Truth is clear, direct and simple while pretentiousness is complicated, opaque and wordy." Surely he was thinking of you! Saudi has access to the world Sea Lanes while Iran has access to an enclosed lake. Wow! Prediction here is that Saudi will win easily since this recalls an earlier struggle. in 331 BC at Arbela (Mosul, Iraq) where the Persians w/their pretensions were annihilated. didn't happen at all. Why of course!!! None of your comment address the lack of pipelines available to find other routes for a significant part of the 18 million barrels a day you proposed blockading. Not only would the countries sending that oil out retaliate against such a blockade, so would the rest of the world. Those receiving that oil need it as well. And those not directly receiving it would be greatly impacted by massive spike in oil prices around the world. From oil transport / prices to 2500 year old battles? WTF? Anyone can ping me or the powers to be, certainly not me, if they wish to have a dedicated Iran thread stickied to the top. If I missed any comment wanting to have that, please accept my apologies. This potentially could be even a much bigger news story, I've even seen some articles speaking of war and so forth. I don't think/hope that will happen. It could be considered though. got tangled in all the weed searching and scratching. it's access to both the Indian Ocean and Mediterranean. loser here. Suspect today's oil price was an ominous harbinger. Earlier I made a jest/remark that was uncalled for. The great forum you are a valued member of. I have and will get profane. There iare a lot of things we all will agree or disagree on. Mostly in agreement against the darkness of light. The older this stick gets, the more it gets set in the mud. I actually watched a movie, the other night, with my g-kids. (I don't watch movies). but there was a line in there. Some woman saying "the government wouldn't lie to us". "Religious" or Political". They all lie. I'll be called out later for my words actions and deeds, but don't think you are posting in the wrong place. I get most of what you are saying. And I ain't gonna call on the clown posse, to back me up. Keep on. I enjoy it, even when I don't enjoin it. And hey, come over the Member's lounge. It has everything for every member here. People just talking to people. With their hair down. And that guy snoring under the pool table? It is merely @Frank Cannon . He twitches sometimes. Which is literally a pain in the azz...when you are trying to sleep under the pool table. Page created in 1.458 seconds with 22 queries.